Home / event / Valentine's Day Party / Valentine's Party for Singles! Get ready singles! Worry no more about all the love and craziness that will be poured over this coming Valentine's Day, because in Sta. Rosa, Laguna, a V-Day Party meant for everyone to enjoy is set to happen! Oops, no hate on this post! Just pure unabused celebration we could all enjoy! Happening this February 15, a day after the busy Valentine's Day, Southstar Park in National Highway, Brgy. Macabling, Sta. 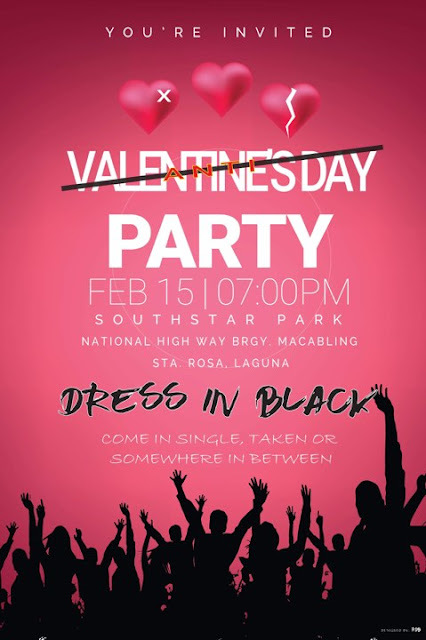 Rosa, Laguna, Anti-Valentine's Day Party is Valentine's Day for all packed with music from Manila's top DJs. Expect the unexpected as the organizers invite guests to come in black outfit and asked to be ready to get wild and soaked on the rave party with foam shower. On top of these, booth and other Anti-Valentine's Day gimmick are prepared for every bitter person in town such as the "Tangnamuka" - a freedom wall where guests can pin picture or pictures of their former partners in exchange of a plate, which the can throw at those pictures. If the participant hit his or her target, they could get a special prize from the organizers. One activity for single guests to enjoy is the Free Shooters, if they present a photo of their former partners and tear it apart in front of the bartender, they get free drinks! Then, there's also the Kiss and Slap Booth - a matching game booth perfect for those who are still looking for a partner. For this who hopeless romantic, they'll have the "Kapit Lang Besh" Booth - a monkey bar game with a timer. And since this is basically a Single's Party, and the possibility of finding a new love is very high, the organizers also prepared a Wedding Booth, will be made available for fun! Guests who find love with another guest can enjoy this booth together with free marriage contract and photo. This party is brought to us by Colossal Mega Events. For tickets, it is priced at PHP250 and you can purchase them at venue entrance or you may call 0906-7103085 or 0977-7237006. Gates open at 6 p.m. and each ticket comes with a complimentary San Miguel Beer and a freebie. Food stalls and mobile bar are also available inside for those who come to binge on some snacks. See you all there, haters! Hahaha! Happy Valentine's Day!